Many Assassin’s Creed fans were elated when Ubisoft finally revealed their next entry in the series. This will be titled Assassin’s Creed Origins, and as early leaks had suggested, will indeed be taking place in ancient Egypt. And it no doubt was great to see game director Ashraf Ismail take the stage at the E3 show this year to show off his new creation, a game he and his team at Ubisoft Montreal have been working on for the last three and a half years. Ismail recently spoke to Game Informer too, revealing more details about the latest Assassin’s Creed game in a podcast in which he answered several fan questions and shed light on what could end up being the best and most massive Assassin’s Creed game to date. 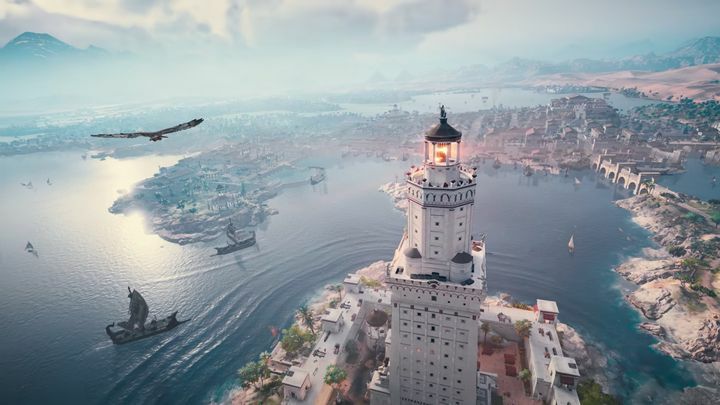 Discussing the game’s size, Ismail revealed how big we can expect the cities in this upcoming Egyptian-set Assassin’s Creed game to be, saying that the city of Alexandria in the game will be at least twice the city of Havana in the earlier Assassin’s Creed IV: Black Flag game. He also compared Alexandria (a more modern Egyptian city which housed the largest library in the world at the time) to Memphis. You will have to be wary of sandstorms when exploring the Egyptian deserts in Assassin’s Creed: Origins. Actually, Memphis was as traditional an Egyptian city as you could get back in the time Assassin’s Creed Origins is set, and according to Ismail this will be full of huge monuments and architecture for players to enjoy too. Additionally, there will also be other cities and tons of villages in Origins too according to its game director, meaning this will certainly be a game that will keep you busy for quite some time when it ships this October. And while thinking of the game’s ancient Egyptian setting might evoke images of the Pyramids or giant Obelisks in your head, it’s clear that Egypt’s massive deserts will play a key role in the game too. Traversing through the deserts you will have to be wary of sandstorms, which as Ismail explains won’t damage the player but do limit visibility, meaning encounters against bandits and wild animals will be trickier in these conditions. But at least the game’s protagonist, Bayek, will have his trusty eagle Senu at his disposal. The eagle will replace the now-famous Assassin’s Creed mechanic of climbing viewpoints to reveal sections of the map, but fortunately as Origins’ game director discusses in the video, Senu can fly as far as your desire for scouting the terrain ahead and revealing possible dangers, which will surely be a plus. 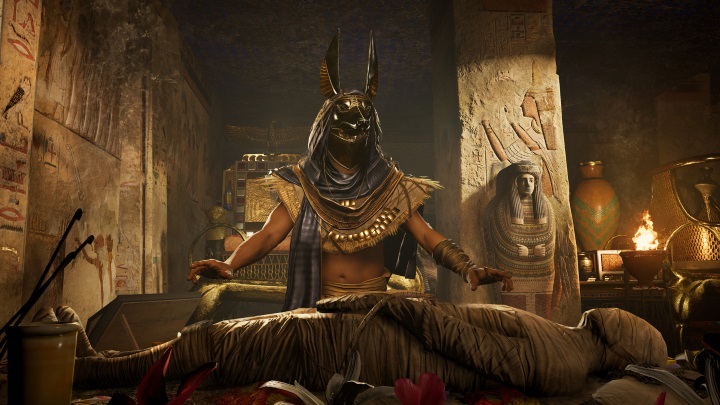 Mummies, treasure and angry priests might await you in Assassin’s Creed Origins reworked tombs. Those looking to explore every corner of Assassin’s Creed Origins’ world will be happy to know that parkour in the game has been improved, with Ismail describing the new system as “super responsive”. This should make players feel more free in the world, and make sure their Assassin does exactly what they want in the game, plus Ismail also revealed that you won’t have to keep a button pressed to run in the game anymore and that this now depends only on how much you push the gamepad stick in a given direction now. Of course, getting around on foot is all fine and dandy, but there will be plenty of mounts to ride in Origins’ ancient Egypt, including camels and horses. These can actually be killed by other animals in the game though, as Ismail confirmed in the Game Informer podcast. Assassin’s Creed Origins’ game director also discussed other aspects of the game during the podcast, including how players would go about upgrading their gear in the game. According to Ismail, you will be able to take weapons to blacksmiths and get these upgraded using materials you found in the world. There is also a crafting system, allowing you to produce items that amongst other things, increase protagonist Bayek’s defences and give a boost to other stats such as stealth. Plus, Ismail also revealed that there will be legendary items in the game too. Overall, Origins’ game director said customization will be “a very important part of the game”, but did not clarify whether it will be possible to customize their character’s facial hair as one fan had wanted to know. It’s likely though, that you will at least be able to buy new clothing for Bayek in-game as was possible in earlier games such as Assassin’s Creed Unity, altering the hero’s look to suit your tastes as you play through Origins. Another aspect of the game fans asked Ismail about was the cover system, and how this would work in-game. Origins’ game director said this won’t be a “hard lock system” like the one seen in another Ubisoft property, Watch Dogs, but rather things will be more fluid in Origins. So, you will be able to walk to a wall or another barrier and Bayek will automatically go into cover mode and be able to assassinate unwary enemies. But this will all happen in a more seamless way than in the likes of Watch Dogs as Ismail clarified in the interview. Games like the great Assassin’s Creed Brotherhood had great modern day sequences… Will Assassin’s Creed Origins follow suit? Things got more interesting, though, when Ismail was posed a fan question about the game’s modern day segments. To this, Origins’ game director replied that he did not want to “ruin the experience of the game”, refusing to reveal more details about the game’s present day sequences. This suggests the modern day sequences will be a big deal in Assassin’s Creed: Origins. Actually, leaked information which found its way online before the game’s E3 reveal suggests there will be playable present day sequences here, and that fan-favourite characters like Desmond will be making an appearance too… For the time being though, it’s clear game director Ashraf Ismail does not want to delve into this aspect of the game, although hopefully we will get to know more about it as Assassin’s Creed Origins launch date nears. 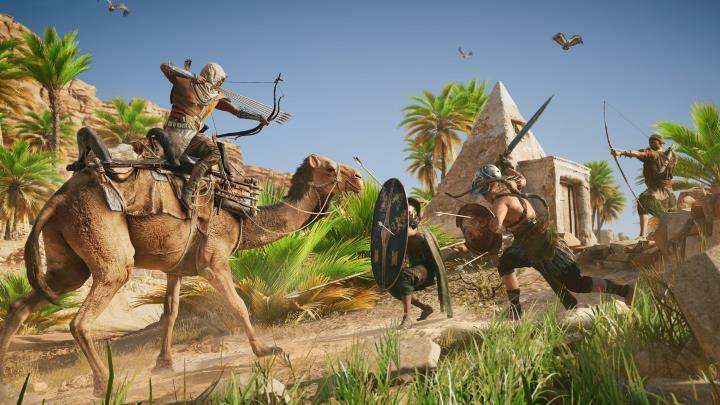 Regarding the game’s storyline, Ismail said this will be a “personal journey” for Bayek. And the whole thing takes place more than one thousand years before Assassin’s Creed I, and explains how the Assassins and specific things like their rituals came to be. As Ismail said in the interview, the story will reveal that something special in Bayek’s life that “struck a chord” and led to the formation of the iconic Brotherhood. Ubisoft’s game director, however, did not say whether the game takes place over decades or a shorter time frame like the original Assassin’s Creed or the more recent Syndicate, though. 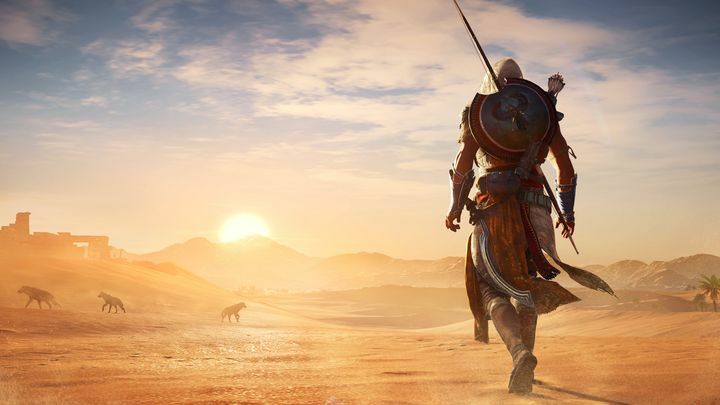 It’s clear, however, that this will be a deep story that ties protagonist Bayek’s life to the grander scheme of things, and one which Assassin’s Creed fans worldwide will surely be looking forward to experience no doubt. Also, those who have seen the game’s world premiere trailer shown at E3 this year couldn’t have helped but be surprised by what was seen at the end of the trailer – Bayek duelling a giant snake which looked straight out of last year’s Gods of Egypt movie. When asked about this, Ismail said he and his team at Ubisoft Montreal did not want to “jump the shark” by adding fantastical elements, but still admitted that ancient Egypt had a lot of mysteries and mysticism, meaning players should expect to find things out of the ordinary in their playthrough of Origins. Ismail wants to bring that to the player experience, but the game will remain credible in spite of this though. Assassin’s Creed Origins looks like it will be packed with exciting features, and will likely also boast stunning graphics both on consoles and PC. And many of you might be thinking that this could end up being a Game of the Year candidate, something that game director Ashraf Ismail was asked about during the interview. To this, the Ubisoft veteran responded that he’s proud of the game and proud of his team, which according to Ismail have been working their butts off for almost four years now to deliver as great a game as possible. Of course, not everything’s is perfect and Ismail admits he and his team got a lot of feedback at E3, and certain things such as a dodge animation (which some fans didn’t like) are being improved now as the game comes close to shipping. But hopefully Assassin’s Creed Origins will turn out to be as great as the earlier Assassin’s Creed IV: Black Flag was back in 2013, delivering the sort of experience that the series has become famous for over the years when it debuts this fall.